She Spoke: 14 Women Who Raised Their Voices and Changed the World, gives readers the opportunity to hear the words of poet Maya Angelou, activist Malala Yousafzai, scientist Temple Grandin, and more at the touch of a button. She Spoke will inspire readers of all ages to share their own truths and change the world. When the world tells you to stay quiet, do you listen, or do you speak up? 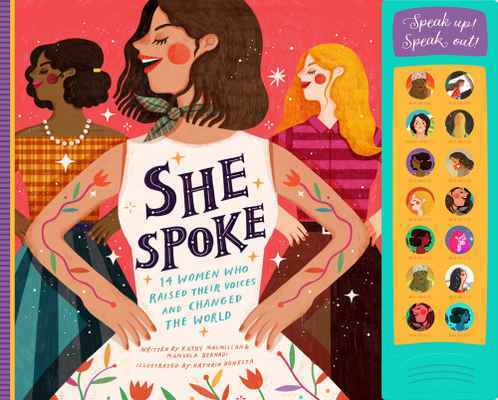 In She Spoke: 14 Women Who Raised Their Voices and Changed the World, with the touch of a button readers can hear Maya Angelou, Mary McLeod Bethune, Shirley Chisholm, Hillary Rodham Clinton, Tammy Duckworth, Leymah Gbowee, Jane Goodall, Temple Grandin, Suzan Shown Harjo, Dolores Huerta, Joanne Liu, Abby Wambach, and Malala Yousafzai.